History Week is almost here! Mark Dunn and the team at the NSW History Council have done a marvellous job teeing up a whole suite of interesting and exciting events. 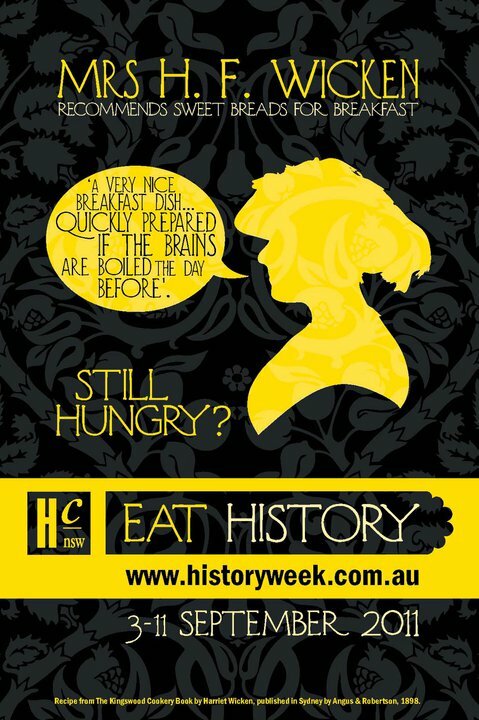 This year’s theme, Eat History, is rather topical, and all the buzz has even encouraged my old friend Harriet Wicken to join Facebook. Who would have thought? It’s great to see interest in history being generated. The City of Sydney, Sydney University, State Records NSW, Tony Bilson (!) , and a whole host of other people and organisations have stepped in to create what is certainly going to be the biggest history week so far. In the spirit of collegiality, I thought I’d pull out a book I scored at a Queensland market a few years back. 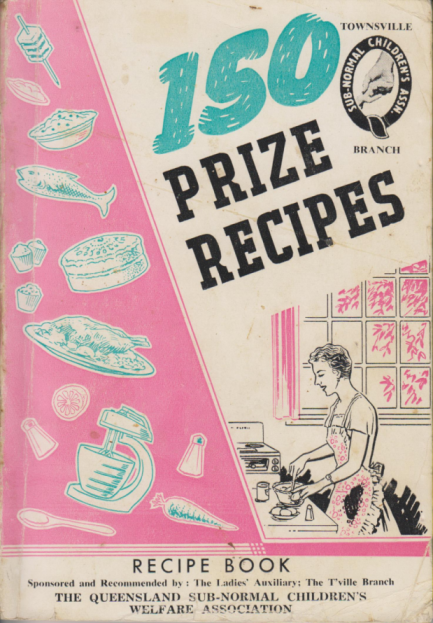 It’s the 150 Prize Recipes Book, “sponsored and recommended” by the Ladies’ Auxiliary of theTownsville Branch of the Queensland Subnormal Children’s Welfare Association. Murmurs emerged from Townsville about the formation of a branch of the Subnormal Children’s Welfare Association as early as 1953, but was not until 1958 that the Branch was formally established. Its launch was followed by a characteristic flurry of activity, including the circulation of letters to parent organisations across Australia seeking “the fullest possible advice on the establishment of a Centre,” and the launching of a series of public appeals and fundraisers. By March that year, the Branch had accumulated over £5,000. This allowed the purchase of a vacant block of land, and further fundraisers were held to enable the construction the “school with attached residential” recommended by similar parent groups. Over the next eighteen months, these initiatives (which probably included producing 150 Prize Recipes) had raised more than £22,000. Opened in April 1960, the Townsville Branch’s school was educating over 60 sub-normal pupils by 1962. This is the only fundraising recipe book that I am aware of, but large-scale community appeals were a staple activity of parent organisations for subnormal children in the post-war period. Countless badge days, raffles, lotteries, cat shows, and charity concerts raised funds and promoted the cause of sub-normal children. The appeals reflect a new spirit of voluntarism which emerged after the Second World War, and which differed from earlier charitable activities (such as those involving Minda in Adelaide). The new voluntarism was predicated on a spirit of “self-help:” parents took the initiative and implored the public to “help us help ourselves.” By and large, the appeals were remarkably successful, significant amounts of money, and awareness, were raised. 150 Prize Recipes alerts us to some fairly typical characteristics of the composition of the membership of the parent groups. Firstly, it is produced by the Branch’s “Ladies’ Auxiliary.” Women’s auxiliary bodies– to schools, hospitals and so forth– have a long genealogy, traditionally involving non-intrusive support and fundraising roles in support of a masculine governing body. Auxiliaries didn’t involve themselves in running the facilities or guiding their direction. Although many post-war parent groups had women as figureheads‑ Gladys Newton of Western Australia’s Slow Learning Children’s Group, Hazel Whiddon of the New South Wales Sunnyfield Association, and Mary Lamond of Sydney’s Sub-Normal Children’s Welfare Association, to name a few‑ women were generally expected to undertake activities such as nurturing children at Day Occupation Centres, baking for cake stalls, and adding “appeal” to the groups’ appeals. Conversely, the “serious” activities of the Branch‑ bookkeeping, liaising with Governments, and the like‑ were left to the men. explained the Secretary of the Slow Learning Children’s Group of Western Australia, in a relatively commonplace observation. Secondly, the overwhelmingly Anglophile names of the contributors to the 150 Prize Recipes indicates the groups’ overwhelmingly white, middle class constituency. “New Australians” (recently arrived refugees or immigrants from Europe) seldom involved themselves with the post war groups, and the retarded children of new arrivals were thought to pose particular problems which might make them unsuitable for treatment in the parent groups’ centres. At the same time, though, the presence of a large number of “exotic” foreign recipes, including Belgian Date Cakes, Sweet and Sour Pork, and Spanish Roast Beef, hints at a growing fascination with foreign delicacies that, a number of historians have argued, partially paved the way for the acceptance of a future multicultural Australia. Boil giblets until tender, adding rice or fine spaghetti and salt. Drain stock into jug. Put approximately two tablespoons butter or margarine into saucepan. Add one large onion finely chopped, 1 carrot grated, and cook until tender. Stir in approximately 1 tablespoon flour. Gook gently. Add stock. Cook until boiling. Add chopped giblets and one tin mushrooms. Finally, add two tablespoons of white wine. Place the yolks of 3 eggs into a large bowl, with 3/4 cup water (cold). Beat until well risen, then gradually add 1 large cup sugar. Beat well until mixture reaches almost top of bowl. Beat whites of 3 eggs with 1 1/4 teaspoons baking powder. Fold into mixture then add 1 1/4 flour. [Vanilla?] Essence to taste. This mixture requires 10in. sandwich tins, or may be baked in a roast meat dish. This makes a variety: Lamingtons, some with jam, and ice the remainder. Place margarine in saucepan. Cut up one average size onion and fry in margarine until golden brown. Cut up fine a 1/2lb. stewing steak. Add meat to saucepan. Add salt and pepper to stewing steak. Add tomato sauce. Cook on a slow fire. Place spaghetti in another suacepan. Cover with water and add one teaspoon of salt. Boil till soft. Strain. Mix sauce and spaghetti and boil for 5 mins. Garnish with grated cheese and serve. Albert Reaburn Reynolds. “From Self-Help Group to Complex Organisation: Evolution of a Welfare Organization with Regards to Its Goals.” PhD Thesis., The University of Queensland, 1984, 187, 190; Helen Gregory. Endeavour Foundation History Project. Unpublished MSS held by the Endeavour Foundation, c. 2008: Ch. 3, 3-4. MRCWA. Eighth Annual Report of the Mentally Retarded Children’s Welfare Association, Oakleigh. Oakleigh, Vic. : MRCWA, 1958: 3. Earl, Dave. “Help for Children and Their Families: Presenting ‘Subnormal’ and ‘Spastic’ Children to the Public in 1950s New South Wales.” antiTHESIS 19 (2009): 148 – 61. I’ve put together a short list on Trove of some of these fundraisers. Minda’s early fundraisers involved, among other things, encouraging Adelaide’s elite to attend an annual concert and make a hefty donation. It was charity aimed at the recipients with a spirit of philanthropic benevolence, not self-help generated by the recipients (or their families). See, for instance: “Helping Minda: Concerts at the Tivoli.” The Advertiser, 18th September 1912, 18 ; “Confusion over Charity Appeals: Loss Caused to Minda Home. Progress of Home.” The Advertiser, 20th October 1938, 21. “Appeal with Appeal!” The Argus, 14th May 1954, 3. “What’s in a Name?” Our Children 7, no. 7 (October 1961): 47. Benjamin, E. “The New Australian Retarded Child.” Our Children 5, no. 1 (January-February 1958): 2 – 3.